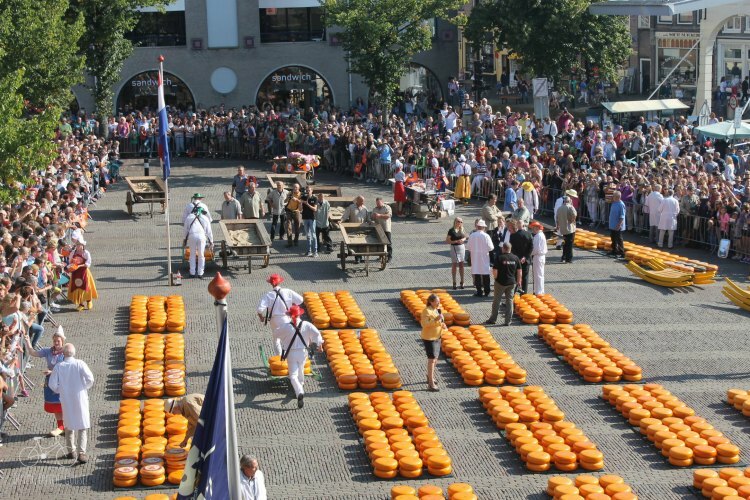 We headed to Alkmaar on a Friday morning to check out this time honored tradition for ourselves. (Alkmaar can easily be reached by train, although we made the easy one-hour drive from Delft.) The market officially opens at 10am but if you’re going you want to get there early as visitors flock from all over to see the market. We arrived shortly before 9am and parked in the €3 all day lot. (Find Alkmaar parking lots here.) It’s a short walk into town across the pedestrian bridge from this lot. We enjoyed an hour at the Cheese Market Museum learning about how cheese is made. There are plenty of interactive exhibits, spread over two floors, that were engaging for the children. There is also an 8 minute video that is available in English. Just ask at the front desk. They even gave us some cheese to sample while we waited for the market to open. Yummy. Gouda! As we finished touring the museum the market was about to begin, so we sat in one of the museum windows to watch the action. We were the only ones in the museum at this point. The actual events of the cheese market are not all that engaging. The kids watched for about 20 min as cheese was loaded onto sleds, weighed and run around the square. When we left the museum at 10:30am there were lots of people headed upstairs to the museum. We spent a few minutes walking around the market and checking out the cheese stalls. It was incredibly crowded! We slowly made our way through town. The further we got from the cheese market, the less crowded it got. There was another small market set up around the Grote Kerk. We were able to pick up some fruit, coffee and snacks to enjoy on our walk. We also poked into the church, which has a full scale cafe inside. The Alkmaar Art Museum is just a block from the church. It is also part of the museumkaart program, so we popped in to check it out. We only explored the first floor with the boys. 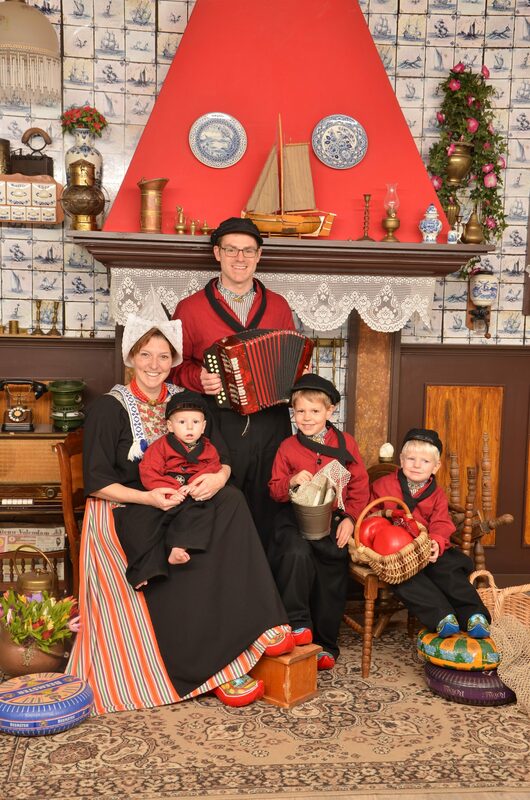 The Portrait of Alkmaar room contains lots artifacts from the city and several interactive exhibits the kids enjoyed. There was also a photo booth in the room that we spent some time enjoying. We found the most lovely place for lunch, Heeren van Sonoy. They have a lovely outdoor space and the food was simple but delicious. The boys shared a large Dutch pancake, I had a delicious club sandwich and Jeff had a platter with meat, cheese, breads and a small cup of cheese soup. We also popped into the Beer Museum (museumkaart). The museum has a program for kids where the kids have to find little mice hidden around the museum and answer questions about beer making. We got one packet in German and one in Dutch, making the questions and answers nearly impossible. The kids found all the mice which kept them entertained so we could read a few things. The nice men at the front allowed the boys to pick a prize, even though their parents couldn’t solve the puzzle! The museum has tons of beer making equipment, signs and glasses from across numerous time periods. There is an English guide available at the front desk. There is no beer in the museum, but there are stairs to a beer bar in the basement where you can grab a pint if the tour makes you thirsty. The kids got a kick out of Alkmaar because one of their favorite books, The Cow Who Fell Into the Canal, takes place here. They recognized several of the bridges and scenes (like the cheese market) from the book. YouTube has a great read along version of the book here.